Curren Environmental, Inc. (Curren) is a professional environmental services company that provides turnkey solutions for a broad spectrum of environmental issues. Curren's experience in tank removals, subsurface evaluations, field sampling, site investigations, and remedial activities has allowed us to provide quality services for over a decade. Our philosophy of hands on management of environmentally sensitive issues has helped establish Curren as a recognized and trusted name for professional environmental services. Our company was founded to address the unmet service needs of the environmental industry. In the world today it is a common perception that service is a dead art. At Curren we understand that ours is a service industry, to which we strive to excel. Our team works with clients to outline the project objectives and our team strives to both manage and achieve these objectives. The heart of our company is professionals in their field that are driven to achieve results. Time over time we have proven our commitment, knowledge and professionalism that can deliver innovative results for our clients. You experience commitment to service excellence every day in our approach, implementation of services and or commitment to our clients. Curren is licensed by the New Jersey Department of Environmental Protection (NJDEP), Pennsylvania Department of Environmental Protection (PADEP) and Delaware Department of Natural Resources and Environmental Control (DNREC) to perform tank closures and subsurface evaluations. Curren maintains a highly capable staff fully trained in environmental investigations and operations, including coordination of field activities, negotiation of site restrictions, sample acquisition, client and contractor interaction, quality assurance, and health and safety procedures. 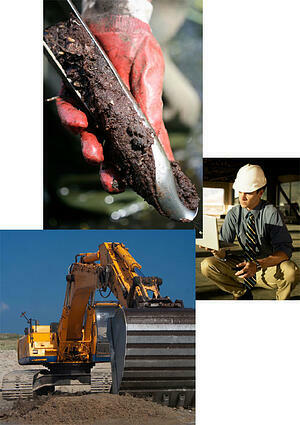 Senior project managers have NJDEP LSRP (Licensed Site Remediation Professional) designation. All field personnel have completed the 40-hour OSHA Health and Safety Training course and are supplemented by the annual 8-hour refresher course.